A real estate investment cooperative has formed in NYC! On Thursday, May 28th, we will gather for the first time as the New York City Real Estate Investment Cooperative at IATI Theater: 64 East 4th Street in Manhattan on the 2nd floor, 6:30-8:30pm. This is an email to announce our next meeting (May 28th), give you a report back on what happened two weeks ago at our first gathering, and encourage you to get involved. 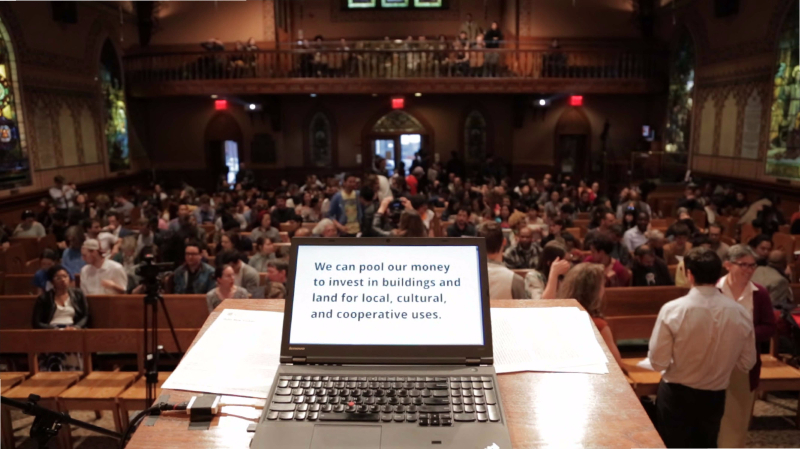 We also wanted to announce that NYC Real Estate Investment Cooperative just received a grant for $1,000 from RSF Social Finance, that we have been selected to present at Pitching the City on May 29th, and that we now have a website: http://nycreic.org! Report back: What happened on April 28? We made something happen together! At our first gathering on April 28th, New Middle Collegiate Church was packed for an evening of teaching and learning. Over 300 people showed up, and over 200 people joined the NYC Real Estate Investment Cooperative, making this initiative a reality! We ran out of membership forms, so we know that there are more of you who want to join. You can do this at our Membership Meeting on May 28th (see below). If you missed the night of teacing and learning on April 28th, or want a review, a video recording of the event is available here: https://vimeo.com/126879980. In two weeks, on Thursday, May 28th, we will gather for the first time as the New York City Real Estate Investment Cooperative at IATI Theater: 64 East 4th Street in Manhattan on the 2nd floor, 6:30-8:30pm. This is a meeting for members to meet members, and to find points of unity so that we can move forward together! We will form workgroups so that members can begin to focus on the area of the investment cooperative that matches their time, interest, and ability. If you do not want to join a workgroup, check back in September. 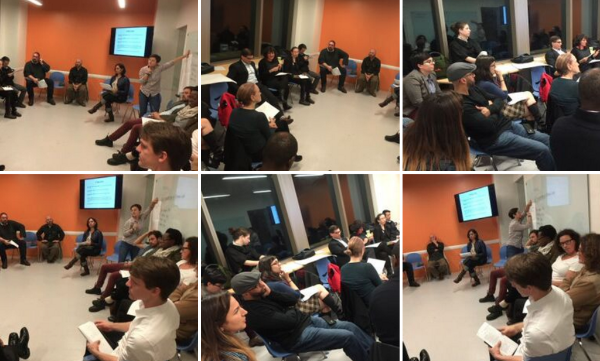 If you want to join a workgroup, but cannot make it on the 28th, email: reic4nyc@gmail.com. Together, over the next few months, we will identify our preliminary criteria to determine investment properties (properties we want to secure) and outreach to investors (members, unions, pension funds, other cooperatives). Our goal is to have a list of realistic properties and the money to secure at least one of them within two years. We will start on May 28th by inviting members to join workgroups that will move our project forward for the next three months. Groups will work independently with facilitators June-July-August and we will come together again on Monday, September 28, 2015 for a membership report back (save the date). If you have not joined yet, you will be able to do so before and after the May 28th meeting (from 6-6:30pm and from 8:30-9pm). Member investments are $10, but we have a hardship fund for those of you who cannot pay $10 at this time. Bring $10 cash for membership, and $20 if you can cover another person who cannot pay. If you can’t come to the meeting on the 28th, stay tuned as we will send an email about downloading the membership form and sending money to our bank account at Brooklyn Cooperative Federal Credit Union soon. Tell your friends to join mailing list! See you on Thursday, May 28th at IATI Theater: 64 East 4th Street in Manhattan on the 2nd floor, from 6:30-8:30pm. Remember to come early or stay late if you still need to become a member. Please RSVP to reic4nyc@gmail.com so we know how many people are coming. New York City Real Estate Investment Cooperative (NYC REIC) leverages the patient investments and political power of members to secure permanently affordable commercial properties in NYC.